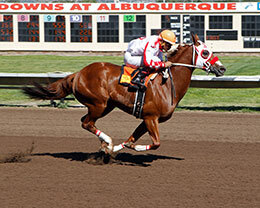 Apollitical Scout, under jockey Jose Amador Alvarez, dominated the $50,000 Balloon City Stakes Sunday afternoon at Albuquerque Downs. ALBUQUERQUE, NM—SEPTEMBER 9, 2018—Apollitical Scout, a 4-year-old daughter of 2010 world champion Apollitical Jess owned by Paragon Farms, dominated her competition to win Sunday's $50,000 Balloon City Stakes for fillies and mares at Albuquerque Downs. Ridden by Jose Amador Alvarez for trainer Jimmy Padgett and sent to post as the 9-10 favorite, Apollitical Scout covered 400 yards in :19.220, and her winning margin was two lengths from 25-1 longshot Miss Fast Prize Tracy. Apollitical Scout posted a 99 speed index, and her clocking was just off of the track record of :18.912 set by Astica in the 2015 Pelican Stakes (R). “She’s just fantastic, a true racehorse,” said Padgett of Apollitical Scout. “She’s a handful everywhere except on the racetrack. She’s a blessing to have in the barn. Apollitical Scout was bred in Oklahoma by Dan and Louise Jones from the Corona Cartel mare Swinging Cartel. Apollitical Scout made her local debut with an equally dominating two-length victory in a 400-yard, $26,000 open-condition allowance for fillies and mares on July 13. The mare was coming off of a Remington Park spring meet during which she won the 400-yard, $100,000 Junos Request Stakes (G2) on June 2 and ran second in the April 28, 350-yard Easy Date Stakes (R) for Oklahoma-breds. Apollitical Scout has won seven of 18 starts, including six of seven at the 400-yard distance, and the $30,000 winner’s share of the purse from her fourth lifetime stakes score pushed her earnings to $378,600. Padgett said that he wasn’t sure what’s next for Apollitical Scout. “She’s ultimately going to become a broodmare,” he added. Trainer Wesley Giles saddled runner-up Ms Fast Prize Tracy for owner Melvin Neugebauer. The daughter of multiple stakes sire Captain Courage is out of the Shazoom mare Fast Prize Tracy, dam of Ruidoso Futurity(G1) winner Apolltical Chad. Bred in Texas by Weetona Stanley and W.E. Smith, Ms Fast Prize Tracy picked up $10,000 for today's effort to bring her bankroll to move than $75,000. One Famous Ribbon, a stablemate of Ms Fast Prize Tracy, finished three-quarters back to get third. Also owned by Neugebauer, trained by Giles and bred by Stanley and Smith, the daughter of leading sire One Famous Eagle is out of the Corona Cartel mare Fast Prize Ribbon. 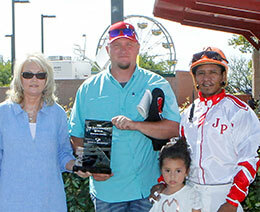 The Oklahoma-bred filly earned $5,000 to bring her total bankroll to $66,666. Pitchin Woo, Everybuddys Talkin, Sinsational Tacha, Staggering Stride, Pilota On Fire, Hardtookiss, and Coronas Dashin Injun completed the order of finish.